Ronnie James Dio passed away in 2010 after battling stomach cancer. On Saturday, Germany held their heavy metal Wacken Open Air music festival and fans were stunned when they saw what appeared on the stage. 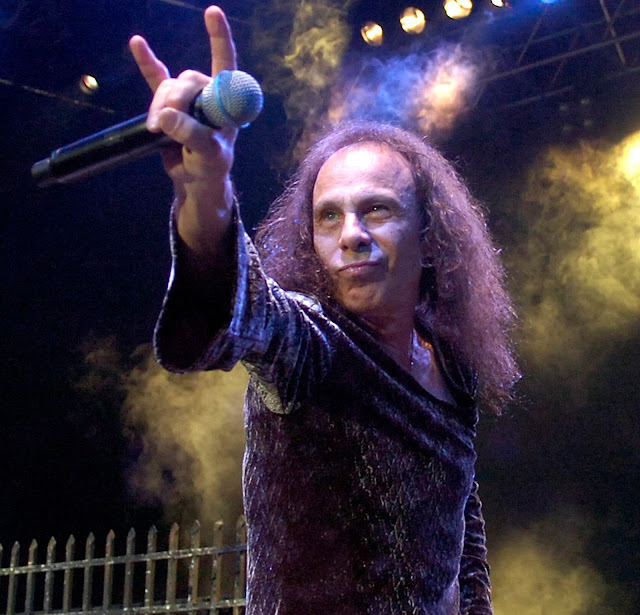 They saw Dio, in hologram form, perform as it yelled out the heavy metal anthem “We Rock.” The Dio hologram also flashed the famous “devil horns” hand gesture that Ronnie made famous. The group that created the hologram, Eyellusion, came from across multiple music and technical industries and has taken over a year to come to fruition. Their goal was to create a believable hologram of Ronnie Dio that could be used with the band Dio Disciples, a group that formed to keep performing the music of Dio. The band formed shortly after Dio’s death. Wendy Dio, Ronnie’s widow, commented about seeing her late husband on stage once again. Craig Goldy, now a guitarist for Dio Disciples, was part of Ronnie Dio’s band in the 80s. Goldy spoke about the experience of seeing his former lead singer once more. EyeIlusion was inspired to create the hologram of Dio when they saw the hologram of Michael Jackson at the Billboard Music Awards in 2014. The Jackson hologram did his trademark moonwalk across the stage. Jeff Pezzuti, the CEO of EyeIlusion wanted to do something more with holograms. He wanted to be able to mimic what a crowd would see at a concert. Pezzuti spoke with many people who were representatives of music artists. As he was networking, he met with Wendy Dio. The two instantly bonded. According to Pezzuti, Ronnie Dio was “probably my first choice.” Pezzuti commented further after he mentioned that he saw Dio live in 1985 and he said, “I was never the same again.” Wendy Dio commented about the appeal of Pezzuti’s offer. In order to have the hologram of Dio appear to be singing, the group had to remove all the music from a live performance “We Rock” except for Ronnie’s voice. In order to get the hologram to be a duplicate of Dio, thousands of pictures and videos were studied. It was decided that they would go for a look of Dio in his prime. As EyeIlusion evolves, they believe they will be able to add more songs to be able to be used for the Dio hologram. Pezzuti has set a goal of being able to rotate a setlist of 14 songs from Dio. Ronnie James Dio, in hologram form, may be back touring again in 2017. Louis-babcock. "Ronnie James Dio: Heavy Metal Icon Returns From The Dead In Germany." The Inquisitr News. 2016. Accessed August 08, 2016. http://www.inquisitr.com/3394577/ronnie-james-dio-heavy-metal-icon-returns-from-the-dead-in-germany/.